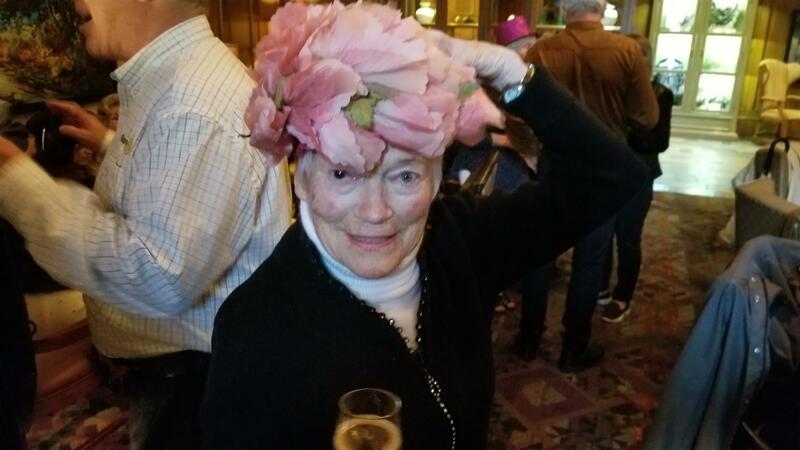 On June 8th at the Fairmount Chateau's "Fairmont Friday" in the Mallard Lounge, Rotary Club of Whistler President Ken Martin presented Isobel MacLaurin with an honorary membership to the Club. Rotarians, family, friends, artists, retired foresters and all who cherish Izzy and late husband Don's substantial contributions the Community over the past 50 years were happy to raise a glass: most likely a glass of champagne. Vintage hats and furs were worn by many to commemorate the style and accomplishments of this couple. They came to Whistler in 1951. As time, work and a family of 4 children would allow they made and lasting imprint with substantial contributions to the development of Whistler. Izzy was an artist and Don was a forester. Strong and passionate outdoors people, they walked all over this valley, soon creating trails, marking them with signage and cairns; organizing a group to build hiking huts at Russet Lake and Wedgemont. Long time Rotarian Don made the first hiking trail map for Whistler in 1971. Don, with Izzy at his side was the driving force behind preserving Lost Lake as a park thus saving it from developers. They always saw the value of this area eccologically and spiritually thus initiating the design and inseption of the Whistler Interpretive Forest. The suspension bridge over the Cheakamus River is named "MacLaurin's Crossing" after Don. This beautiful couple gave with huge depth of soul to the community of Whistler. Izzy holds the fort at meetings with her history and wit; a champagne glass in hand. They were a partners who knew how to have fun as well as contribute, vigorously sharing this skill!